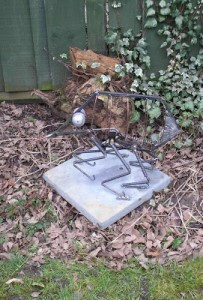 The welded flea sculpture made as part of my Artist Welding course at Chelsea is now finished. The slate base has been drilled and filled with epoxy and the mounting plates screwed down to it. The backlegs were also tied down using wire so that the legs articulate nicely. Springs have been added so that the flea can bounce up and down. The temporary bolt that was acting as a pivot has been replaced with a shiney new phospohor bronze one. A small copper pipe from the hobby store has been added to the head for the flea’s mouth. To balance the sculpture a lead counterweight has been added to the back of the flea, held in place with some epoxy. 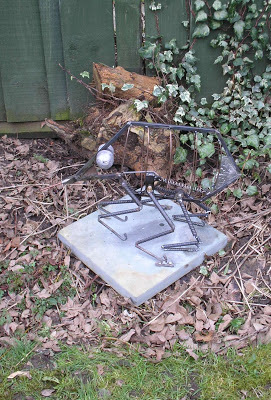 The flea has been moved out into the garden where the steel will slowly rust and turn and nice brown flea colour. I’m also waiting for it to rain as the slate takes on a lovely dark green colour when wet.